Bridged networking (also known as network bridging or virtual network switching) is used to place virtual machine network interfaces on the same network as the physical interface. Bridges require minimal configuration and make a virtual machine appear on an existing network, which reduces management overhead and network complexity. As bridges contain few components and configuration variables, they provide a transparent setup which is straightforward to understand and troubleshoot, if required. 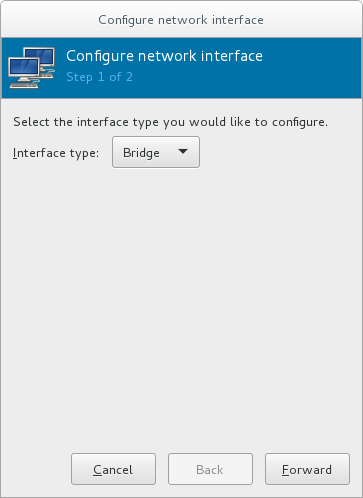 Bridging can be configured in a virtualized environment using standard Red Hat Enterprise Linux tools, virt-manager, or libvirt, and is described in the following sections. However, even in a virtualized environment, bridges may be more easily created using the host operating system's networking tools. More information about this bridge creation method can be found in the Red Hat Enterprise Linux 7 Networking Guide. Bridged networking can be configured for virtual machines on a Red Hat Enterprise Linux host, independent of the virtualization management tools. This configuration is mainly recommended when the virtualization bridge is the host's only network interface, or is the host's management network interface. For instructions on configuring network bridging without using virtualization tools, see the Red Hat Enterprise Linux 7 Networking Guide. This section provides instructions on creating a bridge from a host machine's interface to a guest virtual machine using virt-manager. Depending on your environment, setting up a bridge with libvirt tools in Red Hat Enterprise Linux 7 may require disabling Network Manager, which is not recommended by Red Hat. 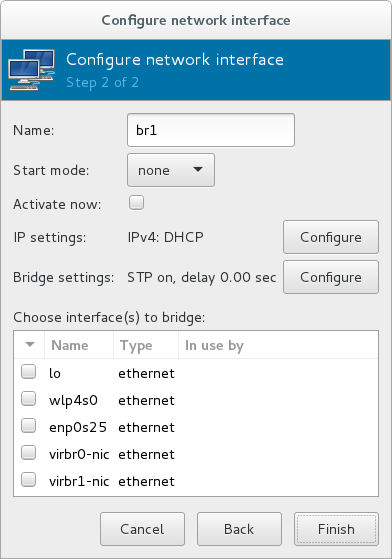 A bridge created with libvirt also requires libvirtd to be running for the bridge to maintain network connectivity. It is recommended to configure bridged networking on the physical Red Hat Enterprise Linux host as described in the Red Hat Enterprise Linux 7 Networking Guide, while using libvirt after bridge creation to add virtual machine interfaces to the bridges. From the virt-manager main menu, click Edit ⇒ Connection Details to open the Connection Details window. Click the + at the bottom of the window to configure a new network interface. In the Interface type drop-down menu, select Bridge, and then click Forward to continue. In the Name field, enter a name for the bridge, such as br0. Check the Activate now check box to activate the bridge immediately. To configure either the IP settings or Bridge settings, click the appropriate Configure button. A separate window will open to specify the required settings. Make any necessary changes and click OK when done. Select the physical interface to connect to your virtual machines. If the interface is currently in use by another guest virtual machine, you will receive a warning message. Click Finish and the wizard closes, taking you back to the Connections menu. Select the bridge to use, and click Apply to exit the wizard. To stop the interface, click the Stop Interface key. Once the bridge is stopped, to delete the interface, click the Delete Interface key. Depending on your environment, setting up a bridge with libvirt in Red Hat Enterprise Linux 7 may require disabling Network Manager, which is not recommended by Red Hat. This also requires libvirtd to be running for the bridge to operate. It is recommended to configure bridged networking on the physical Red Hat Enterprise Linux host as described in the Red Hat Enterprise Linux 7 Networking Guide. This will turn off learning (flood) mode on all bridge ports, and libvirt will add or remove entries to the FDB as necessary. Along with removing the overhead of learning the proper forwarding ports for MAC addresses, this also allows the kernel to disable promiscuous mode on the physical device that connects the bridge to the network, which further reduces overhead.